After snapping us back to reality I felt Polly’s body lying lifeless in my arms. I gently put her down on the floor and heard Guy coming into the room. ‘What happened?’ He said and bent down next to Polly to check her pulse. Guy shook his head and had to strain not to scream at me. ‘You want to take Polly’s body with you?’ Guy responded in a smirking voice while he lifted her and walked out of the room. I kicked against a wall and swore because it hurt. Stupid Guy, acting like it was my fault Polly got hurt. A deep breath took me back to Hamlet’s castle. The place was in ruins and there was no sign of either Hamlet or any of the other characters from the play. I sneakily looked around, looking for clues where he might have gone, but there was nothing. ‘I don’t know! Find that goddamn Writingdesk Conundrum!’ Guy angrily turned away and continued doing all kinds of medical things to Polly. A bit in shock about Polly’s state and pissed off at Guy I went to my bedroom and slammed the door. I sat down on my bed and dropped my head in my hands. Polly really couldn’t die. I got dizzy thinking about all the things that could go wrong. What was I supposed to do if she didn’t make it? Suddenly I noticed that people were huddled up against my window. Everyone was staring at my misery and there was even a small video camera taping everything for future generations. I got up and closed the curtains so they couldn’t see me anymore, but as soon as they were shut out they started screaming and knocking. ‘Shut up!’ I shouted back. A rush of voices streamed over me and started I felt my blood boil. ‘ Goodness gracious, me! Poe! What are you doing here? You know you are not allowed here anymore.’ A very strange person stepped out from among the trees into the light of the lamp-post. He carried an umbrella, was a man from the waist upwards, but his legs were shaped like a goat’s (the hair on them was glossy black) and instead of feet he had goat’s hoofs. He was a Faun. ‘I know, Mr. Tumnus. I think I got here by accident.’ Poe said like a little boy. ‘Are you in trouble, boy? Let’s get inside and have some tea.’ He gave his umbrella to Poe so he could hold it over both their heads and they walked off, making sounds with their footsteps in the crispy snow. Once inside the cave, Mr. Tumnus started boiling water and gave Poe a blanket to stay warm under. It had been a bad winter in Narnia. Mr. Tumnus gave me a cup of tea and sat down next to me. His little goat’s feet dangling in the air and his tail waving from left to right. ‘Always so stubborn. Now tell me slowly of your troubles, I might be off service to you. I might not be the smartest animal in the forest, but I am your friend.’ He smiled warmly and I explained my whole story once again. 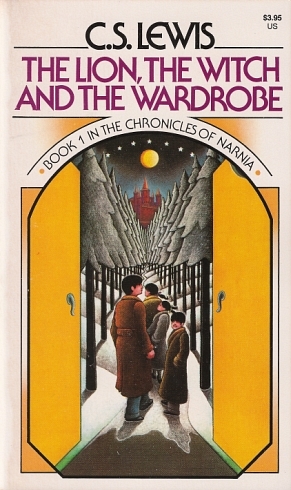 I had been in Narnia many times. When I was young I used to love the books and as soon as I was conscious enough about my powers I visited as often as I could. Off course the story had to stay in the right order, so I never met any of the children. The narrative always followed them around and their curious nature would have led to a story disaster. I was not one of the chosen children of Adam and Eve, so I was to stay out of the way of anything important. But staying out of the way wasn’t one of my strong suits and after I accidently came into contact with the White Witch. She tried to seduce me with candy, spice and everything nice, but nothing worked. She got so angry at this that she tried to freeze me into a statue, which backfired and killed all her reindeer. With this I messed up the entire first book, without her reindeer she would never meet Edward and the story couldn’t continue the way it was supposed to. Aslan had to come back in secret and banished me from Narnia. He knew I was from the real world and explained to me that changing a story was a very dangerous thing. I guess I didn’t really get the message. Mr. Tumnus stared gloomily ahead. He seemed to be thinking while his hoofs were clacking against one another. The sound started to annoy me. He made me laugh and for some reason I felt a little less cold. I threw off the blanket and gulped down the tea in one go. With big steps I walked out of the cave, into the snow. I followed a path we had made with our footsteps to the lamp-post and from there on to the trees. They got thicker and closer together. I felt some prickly needles, but they soon turned into soft fur. My knee knocked against the closet’s door and I slowly opened it from the inside. I stepped out into the room where we never went. It had no windows which made me feel better. Outside of the door I heard voices. One made my heart jump and without any caution I ran towards Polly. She got a bit scared, but when she recognized me, her face lit up. I hugged her like crazy and she started laughing. He was standing at the window, looking out over the road leading to our house and the road was filled with extraordinary people. Frankenstein’s monster was scaring people, some oompa loompa’s were performing one of their dances and a knight tried to fight a reporter with a camera, screaming it was a monster. We exchanged a troubled look while Humpty Dumpty fell of a small wall.